Silas Deane, a Connecticut merchant and member of the Continental Congress, went to France to persuade the king to support the colonists in their struggle with Britain. Pierre-Augustin Caron de Beaumarchais was a playwright who had access to the arms and ammunition that Deane needed. And the Chevalier d'Éon was a diplomat and sometime spy for the French king who ignited a crisis that persuaded the French to arm the Americans. 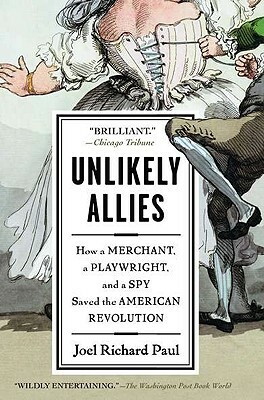 This is the true story of how three remarkable people lied, cheated, stole, and cross-dressed across Europe to gain France's aid as the War of American Independence hung in the balance. Joel Richard Paul studied at Amherst College, the London School of Economics, Harvard Law School, and the Fletcher School of Law and Diplomacy. He currently teaches international economic law, foreign relations, and constitutional law at the University of California Hastings Law School, where he is also the Associate Dean. Previously, he taught at the University of Connecticut, Yale University, Leiden University in the Netherlands, and the American University in Washington. He has also practiced law with an international firm. Paul writes about international trade, globalization, regulatory competition, private international law, and the president's foreign relations powers. He is currently writing a history of U.S. foreign relations and international law.